Chubb (CB) is one of the best managed insurance companies in the world and has increased its dividend for more than 20 consecutive years. Prior to the 2016 merger of Chubb and ACE (the largest merger ever in the history of the insurance industry), these companies had raised their dividends for 33 and 22 consecutive years, respectively. Chubb was even a member of the dividend aristocrats list. The insurance business can be a lucrative one, which is why Warren Buffett’s Berkshire Hathaway owns several of these businesses, including a couple in Buffett’s dividend portfolio here. Let’s take a closer look at Chubb to see if its future remains bright and if today could be a reasonable time to give the stock consideration in a dividend growth portfolio. ACE announced it was acquiring Chubb for $28.3 billion in July 2015 and closed the acquisition in January 2016, adopting the Chubb name globally. This deal created the sixth-largest U.S. property / casualty (P&C) insurer by premiums. ACE also relaunched the new Chubb brand in January last year. The merger brought together two conservative insurers with highly complementary business lines – ACE is more international and focused on large commercial accounts, while Chubb is stronger with middle-market companies and personal lines businesses. The new Chubb provides commercial and personal property & casualty insurance, personal accident & supplemental health insurance (A&H), reinsurance and life insurance to a wide range of clients. The company writes gross premiums of approximately $35 billion. As a result of the acquisition, Chubb implemented major organizational changes resulting in new business segments: North America Commercial P&C Insurance (43% of 2016 premiums), North America Personal P&C Insurance (15%), North America Agricultural Insurance (5%), Overseas General Insurance (28%), Life Insurance (7%) and Global Reinsurance (2%). 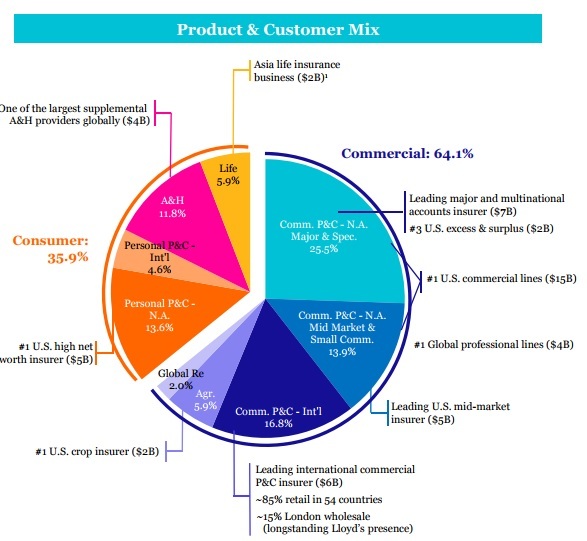 By product line, Chubb generates 56% of its premiums from commercial P&C, 18% from personal lines, 18% from global accident & health and life, 6% from agriculture, and 2% from global reinsurance. By geography, the company writes approximately 62% of its net premiums in the U.S., 14% in Europe, 12% in Asia, 7% in Latin America, and 5% in Bermuda and Canada. Insurance companies make money by writing premiums and investing the proceeds for income before costs and claims need to be paid out. As long as they manage risk appropriately, this type of business model prints money. The new Chubb has several competitive advantages, beginning with the size of the business. Insurance policies generally have little differentiation, which makes price an important selling factor. With the combined company’s massive base of premiums, Chubb can spread its operating costs over wider pool of customers to lower its policy costs, diversify its risks, and offer customers packaged policies that cover a number of types of insurance (Chubb now has one of the largest product portfolios in the global insurance industry). Both of these companies have done an excellent job underwriting conservative policies. 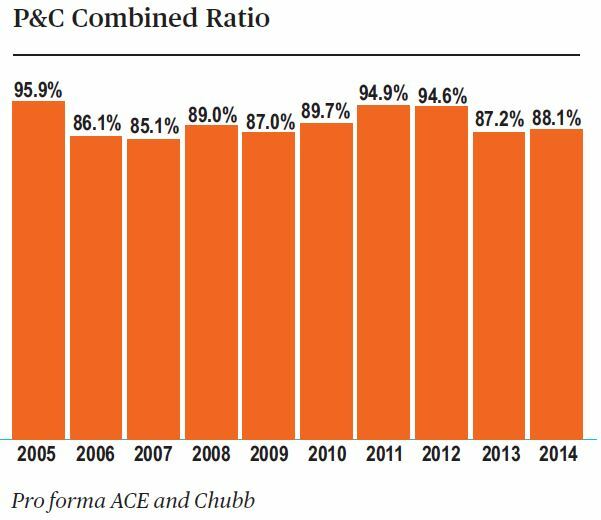 From 2010-2014, ACE and Chubb’s average combined ratio was 90%, and it never ran at a loss (see below). The combined ratio measures an insurer’s costs and claims as a percentage of the total premiums it has written. A ratio below 100% means that the insurance company is generating a profit from its policies and has been smart (or consistently lucky) about the risks it is willing to write policies for. 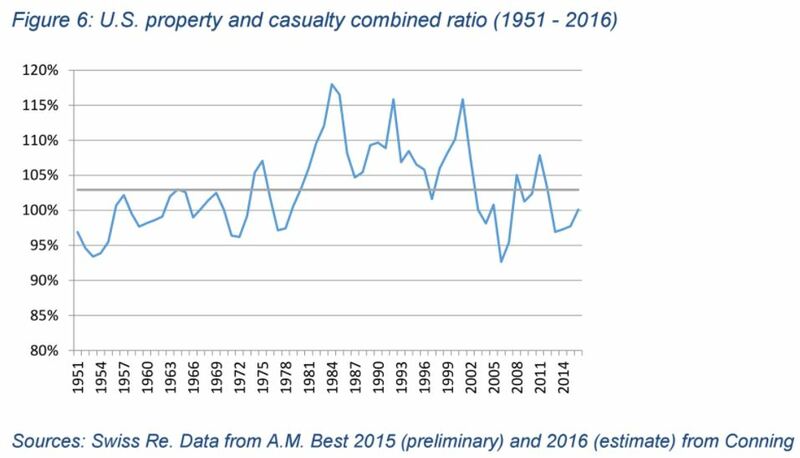 To put this in perspective, consider that the average combined ratio of the U.S. property and casualty industry was 102.8% from 1951 through 2014. In other words, the typical insurer’s underwriting is often unprofitable, forcing them to depend on positive investment results to turn an overall profit. 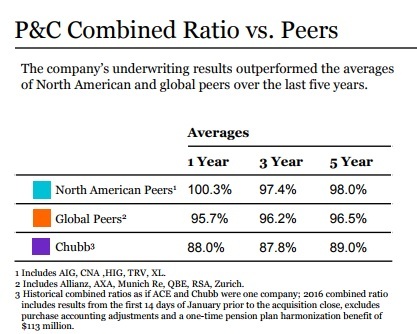 As seen below, Chubb’s combined ratio over the past five years has averaged 7.5 percentage points lower than that of any major insurer in the world, underscoring the company’s skill in understanding and appropriately pricing risk. Total integration-related savings positively impacted the company’s recent combined ratio by about two points, helping Chubb achieve a combined ratio of 88% for the year ended 2016 and highlighting its conservative underwriting. Chubb is already benefitting from acquisition synergies, witnessing a positive impact on almost all of its financial metrics – P&C combined ratio, book and tangible book value growth, and operating ROE (see below). 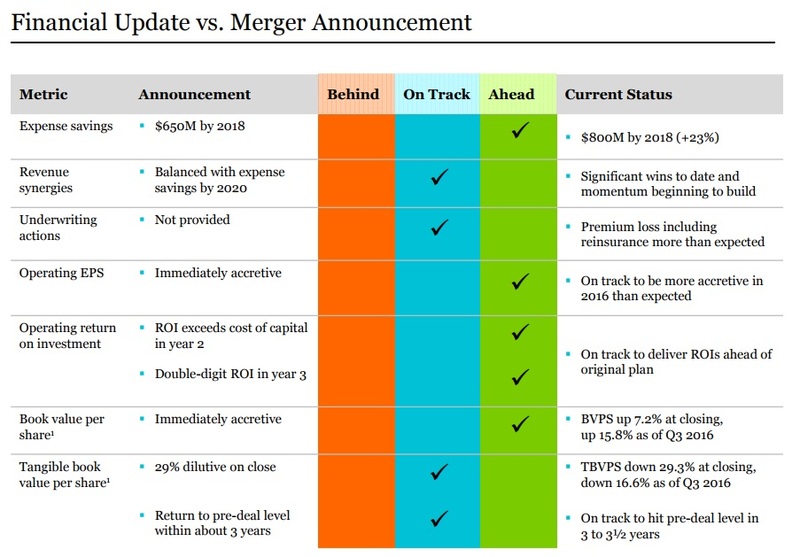 The merger’s main benefits are cost synergies with $325 million already realized, which is ahead of expectations. The company also expects annual run rate savings of $875 million by the end of 2018, and revenue synergies summed up to nearly $300 million for the year. Here is a full financial update on the merger. Besides the merger and both companies’ conservatism, Chubb’s business is advantaged due to its established distribution networks and massive number of field agents to sell its policies. Chubb’s history dates back to the late 19th century, which has provided it with over 130 years to build its network and establish a well-known brand recognized for quality service. New competitors would need years of time and millions of dollars to catch up. The company is well-positioned to capitalize on growth given its strong local reach, underwriting expertise, and diverse product & distribution capabilities. The global P&C market represents a meaningful long-term growth opportunity for Chubb thanks to its sheer size and fragmentation. In fact, the top 10 insurers account for only around 20% of total market share. Whenever a large acquisition is made, numerous risks present themselves – poor strategic fit, difficult integration work, overestimated synergies, employee turnover, cultural challenges, and more. While ACE’s acquisition of Chubb was a huge deal, this also isn’t ACE’s first rodeo. The company has successfully acquired and integrated over 15 businesses in the past, including numerous multibillion-dollar deals, which hopefully helps mitigate some of the risk associated with this merger. While all operational and financial targets of the integration are on track or ahead of schedule, there are still deal-related risks that could impact Chubb’s long-term earnings potential. For example, during the merger, certain underwriting actions were not in accordance with Chubb’s standards or risk appetite. These were rectified to reduce its overall risk but in turn reduced premiums by 2%. Beyond the merger, the insurance industry poses several risks that can impact the company’s near-term results. More specifically, insurance pricing runs in cycles. As previously shown, courtesy of the International Association of Insurance Supervisors, the U.S. P&C industry’s combined ratio has been volatile over the past decade, ranging from a low of 92.6% in 2006 to a high of 107.7% in 2011. When the combined ratio is low, it usually means that the industry has enjoyed a period with few catastrophe events, allowing insurers to rebuild their balance sheets and capital. With excess capital, there is more competition to write policies, which results in pricing pressure. On the other hand, when several natural catastrophe events occur and/or investment income is very poor, there is less capital in the industry and pricing trends can turn more favorable. The industry has seen modest claims since 2013 as evidenced by the combined ratio remaining below 100%. In other words, pricing could remain under some pressure over the coming years as insurers remain flush with capital (industry surplus, an indicator of insurers’ financial health, reached a record $703.4 billion in June 2017). Advances in data analytics could also result in more efficient pricing of policies, although Chubb seems likely to remain at the forefront of change in this area. 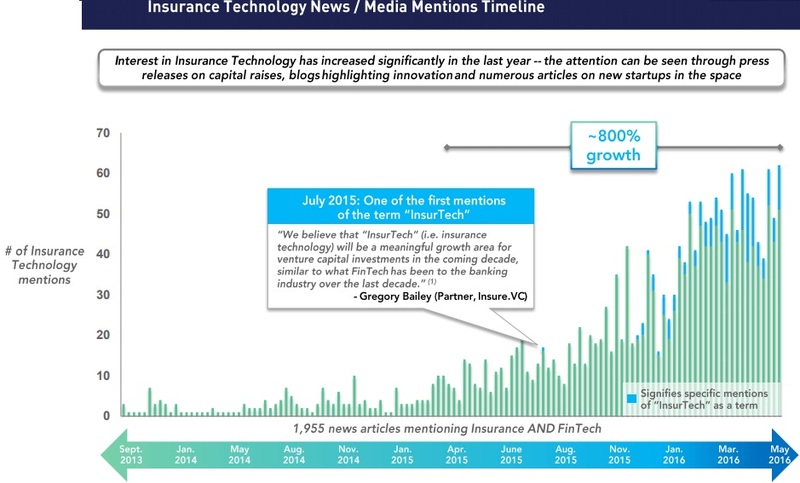 Digital technology in insurance is another emerging threat to established insurers. Smaller players are gaining market share through more flexible pricing models and distribution channels. According to E&Y’s 2017 US P&C insurance outlook, digital technologies, such as social media, analytics and telematics, will continue to transform the market landscape. Chubb has reacted to this new trend by initiating a transformational change into a more digitally integrated company. In addition to industry pricing cycles and digital trends, natural catastrophe events such as hurricanes can obviously have a severe impact on near-term financial results. They are as unpleasant as they are inevitable, but Chubb has the financial health to weather just about any storm. It is also one of the most conservative underwriters of any insurer. Hurricane Harvey is the latest unfortunate disaster to make headlines. The storm is estimated to have caused up to $20 billion in insurable damage. Chubb has a presence in Texas and specializes in insuring pricey homes and other property. However, most homeowners’ policies exclude flood coverage and Chubb has one of the most conservative combined ratios in the industry, so this event seems unlikely to cause the company significant financial strain. Chubb’s long-term earnings power should remain intact, and a hit to other insurers could moderately improve industry pricing, which has struggled in recent years. Investors should also note that in the three months following Hurricane Katrina in 2005, Chubb’s shares rallied more than 25%. A final key risk to consider is the impact that low interest rates are having on the investment income that Chubb can generate. Even after the recent interest rate increases by the Fed, rates remain near historical lows. Investment income is a key driver of an insurance company’s profits, and about 95% of Chubb’s investment portfolio is in fixed-income securities. With interest rates appearing like they could remain lower for longer, investors could be disappointed with the investment income Chubb can generate over the coming years, especially if premium pricing remains pressured. Chubb has a Dividend Safety Score of 95, indicating that its dividend is extremely safe compared to other stocks in the market. Prior to the merger, both companies had earnings payout ratios close to 30%, and you can see that Chubb’s earnings payout ratio and free cash flow payout ratio stood at 28% and 22%, respectively, in 2016. These are very healthy ratios that provide plenty of room for unexpected catastrophe events and offer nice room for dividend growth. Another factor supporting Chubb’s strong Dividend Safety Score is the non-discretionary nature of most insurance policies. Regardless of how the economy is performing, buildings still need to be insured, protection is required from unexpected illnesses, and lives must be cared for. As a result, ACE and Chubb’s sales fell by just 4% and 6%, respectively, during fiscal year 2008. Both companies continued generating excellent free cash flow during the recession, even despite the drop in the value of their investment portfolios. The conservative approach Chubb takes to managing risk with its underwriting and investment portfolio helps the company endure tough times. While the insurance business requires a lot of financial capital to get started, it requires little in the way of tangible assets, resulting in great free cash flow generation. Chubb has earned commendable returns on capital for shareholders over the last decade, generating a high single-digit return in the recent years. While insurance is a commodity, Chubb’s economies of scale and risk management skill have helped it outperform many of its competitors. Regarding the balance sheet, ACE did take on around $5 billion in debt to finance its acquisition of Chubb. However, S&P has issued Chubb an AA credit rating, and the company’s overall financial health continues to look very good. All things considered, Chubb’s dividend appears to be extremely safe due to the company’s low payout ratios, excellent free cash flow generation, non-discretionary services, and healthy balance sheet. Chubb’s Dividend Growth Score of 55 suggests that its payout growth potential is only about average. Prior to acquiring Chubb, ACE had increased its dividend for 22 consecutive years, and Chubb was already a dividend aristocrat with 33 consecutive dividend raises. Chubb has a target payout ratio of 30%, with an aim to preserve capital in line with risk and growth opportunities. The company had last raised its dividend by 3% in 2017, and future dividend growth will track earnings since the firm’s payout ratio is already near its target. Therefore, dividend increases in the low to mid-single-digit range seem most likely going forward. Insurance stocks are typically valued using the price-to-book ratio, with average insurers recording a ratio near 1.0. Chubb’s price-to-book ratio stands at 1.28 today, reflecting its higher business quality and remaining near its long-term median of 1.14. Chubb has a good record of growing its book value per share as compared to its peers. 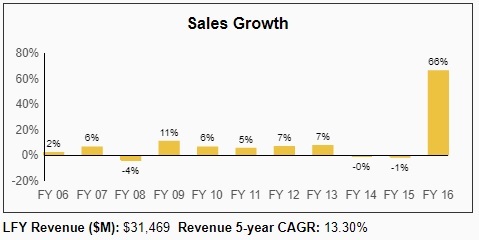 The company has grown its book value per share at 14.7% CAGR over the last five years and should continue enjoying healthy growth thanks to cost synergies, operating leverage, and potentially rising interest rates. With a dividend yield just above 2% and the potential to generate mid-single-digit earnings growth, CB’s stock appears to offer annual total return potential of 7% to 9% (2% dividend yield plus 5% to 7% annual earnings growth). The company seems reasonably priced, especially given its superior business quality. However, a lot of the company’s value admittedly rests on the long-term success of the merger. Although it’s still early in the grand scheme of things, Chubb appears to be well on track in successfully managing one of the largest mergers in the insurance industry. The company’s merger goals are all on track or ahead of schedule, positioning Chubb to remain a force in the P&C insurance market for many years to come. While market conditions have been soft in recent years, Chubb remains in excellent financial healthy and should continue to generate consistent dividend growth and healthy long-term returns. Tough times in the insurance industry … not sure if I would buy here!